After Hurricane Michael crashed along the Florida panhandle and heaved inland, the burgeoning medical cannabis industry of the American Southeast and Mid-Atlantic took notice. Trulieve, which owns 20 dispensaries in Florida, is collecting supplies for neighbors in need of assistance. The increasing threat of tropical storms and the quickly expanding cannabis markets in states like Florida and Virginia tee up opportunities to consider business insurance policies. How should a cannabis business prepare for natural disasters? Mike Sampson, Insurance Recovery Group partner at Reed Smith, addresses the concerns over wildfires in California, hurricanes in Florida and everything in between; he says the key is open communication with your insurance provider. The steps required to initiate an insurance claim are laid out in individual corporate policies. With that in mind, it’s best to consider your policy in detail—before the unexpected occurs. Much like an emergency exit plan, it’s a good idea to keep an emergency insurance claim plan tucked somewhere into your overall business model. Sampson has written about this subject elsewhere, too: “Today, cannabis-related businesses – especially those in the medical-marijuana industry – can and do obtain various coverages, including, but not limited to, commercial general liability, property, and workers’ compensation insurance. They may also be able to obtain some coverage for damage to their crops from specialized insurers. While the market for all of these coverages may still be limited, there are insurers that will underwrite various types of policies for cannabis-related businesses. As the cannabis industry expands across the U.S., a new variety of natural disasters joins the more typical threats seen in legacy markets out West (earthquakes, wildfires). 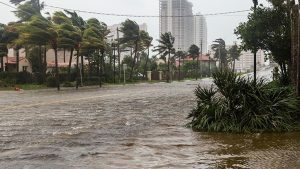 Now, a hurricane that spins off the Gulf of Mexico can pose a major problem for cannabis growers—whether through loss of property and plants, loss of electricity (and thus a significant business interruption) and other issues that can affect you and your team’s personal lives in a plethora of ways.